CONVERSABLE ECONOMIST: The Rise in Polarization: Both Real and Exaggerated? 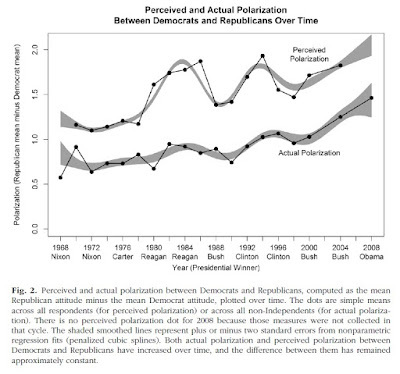 The Rise in Polarization: Both Real and Exaggerated? Political polarization refers to the phenomenon that more people are self-identifying as being at one end or the other of the political spectrum, with fewer in-between. 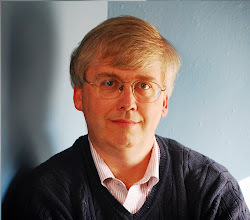 Jacob Westfall, Leaf Van Boven, John R. Chambers, and Charles M. Judd argue that the rise in polarization is real, but also that people have an exaggerated perception of the extent of polarization, in "The Perceiving Political Polarization in the United States: Party Identity Strength and Attitude Extremity Exacerbate the Perceived Partisan Divide." It was published in Perspectives on Psychological Science (2015, 10:2, pp. 145-158). (The journal isn't freely available online, but many readers may have access through library subscriptions. Here's a figure that, with some explanation, tells their story. 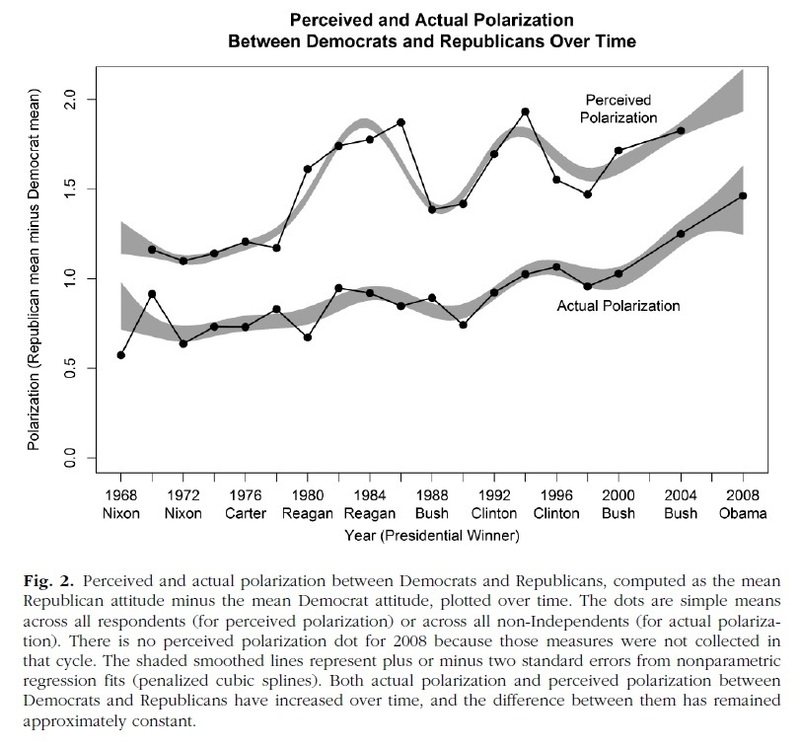 The bottom line shows a measure of actual polarization, which seems to have started rising in the 1990s. The top line shows the perception of polarization. The perception is consistently above the reality, and it's also more variable--for example, showing jumps in the 1980s and 1990s. The definition of "polarization" here is based on opinion survey data from the ongoing American National Election Study, which started back in 1968. Part of the survey asks people a set of questions about their beliefs on various issues. Here's an example of the kind of question a respondent would read. Some people think the government should provide fewer services, even in areas such as health and education, in order to reduce spending. Suppose these people are at one end of a scale, at point 1. Other people feel that it is important for the government to provide many more services even if it means an increase in spending. Suppose these people are at the other end, at point 7. And of course, some other people have opinions somewhere in between, at points 2, 3, 4, 5, or 6. Other questions are about rights of the accused, defense spending, guaranteed jobs and income, urban unrest, and others. "For each issue, the option at one end of the scale represents a stereotypic liberal response, whereas the option at the other end of the scale represents a stereotypic conservative response." Based on this survey data, the basic measure of political polarization in the figure above is straightforward: average the scores for self-identified Republicans, average the scores for self-identified Democrats, and subtract to get the gap between the two. However, respondents to the survey were also asked about how they perceived the attitudes of the Democratic and Republican parties and their presidential candidates. From this data, you can calculate how self-identified Democrats perceive Republicans and how self-identified Republicans perceive Democrats, and compare the perception to the reality. What factors help to explain why the perceptions of polarization are consistently higher than the actuality? Westfall, Van Boven, Chambers, and Judd suggest several interrelated reasons. One is that the very act of categorizing an "other" party leads to what is sometimes called "groupiness," where people start to exaggerate characteristics of the other group. "Analysis of the ANES reveal that both Democrats and Republicans see the other group as more polarized than their own group ... Independents ... perceive the stances of both the parties and the presidential candidates as being closer together than do the partisan respondents on either side." Indeed, an ironic but totally understandable phenomenon emerges here: those who are most polarized are also most likely to perceive a high degree of polarization. Those who identify themselves as a "strong Democrat" or a "strong Republican" are most likely to see the other party as showing strong polarization. Those who have the most polarized beliefs themselves on the opinion scale are also most likely to believe that others are extremely polarized. These findings ring true to me. Polarization does seem to be up. But those who bemoan it most loudly, on both sides of the political spectrum, are often bemoaning only how the other side has become polarized--not their own party or themselves personally. The Economies of Africa: Will Bust Follow Boom? What Was Different About Housing This Time?